Convention exclusives are always a combination of frustration and excitement for me, since geography and budget limit me from being able to get any in person. 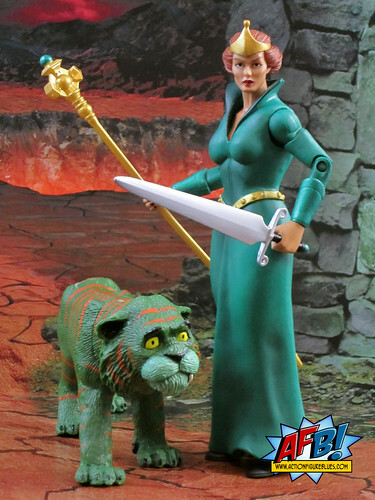 The kind I like best are what Mattel did with their Masters of the Universe Queen Marlena exclusive for this year’s SDCC - different packing, but the regular version still contains all the pieces you need. The version I bought was actually packaged as the Masters of the Universe Captain Glenn figure, but either set comes with all the pieces required to be displayed as either version of the character. This set is a triumph of concept and design by the Four Horseman - both for the options for character and display its provides, and for the way it is done. The Captain Glenn / Queen Marlena switch happens through a design even IKEA would be proud of for it’s flexibility and resourcefulness! I’m on record as being a fan of the MOTUC females - I like the fact that they have a bit of meat on their bones as opposed to the anorexic DCUC ladies with their toothpick arms. Both display options for this pack look great - and it’s doubly impressive that the extra layer of body suit required to make the swap doesn’t make either character look overly bulky. The headsculpts for both characters are also beautifully done, with Queen Marlena in particular turning out very eye-catching. The process of swapping the figure from Captain Glenn to Queen Marlena is a tad fiddly. I didn’t realise at first that there is a bodysuit on Captain Glenn that has to be removed before the Marlena body suit is attached. Once I worked that out, it was just a process of fitting the very tight Queen suit on and sealing it up properly at the back. This really is a very clever design that allows the creation two almost completely different action figures on the one buck. Once you complete the swap, from whichever direction you’re doing it, you get a fantastic and completely different figure. I’m partial to Queen Marlena, as the way in which the Four Horsemen have been able to design her queenly gowns is simply amazing. I just love the shape and flow of it. The astronaut costume, on the other hand, is sleek and suitably space-like, and the greens in it are slightly different - a very nice touch. As if the combo of Queen and Captain wasn’t enough, we also get Battle Cat’s alter ego, Cringer, as a pack-in. The Four Horseman have done a perfect job of capturing Cringer’s look and expression for his headsculpt - I just wish he was a smidge larger - was Cringer really THAT much smaller than Battle-Cat? Regardless, he is well done and well painted, and that facial expression really pops as an authentic representation of his classic look. Good fun, and a clever way of giving us a character that probably wouldn’t get a release on its own. This set comes with a swag of accessories. 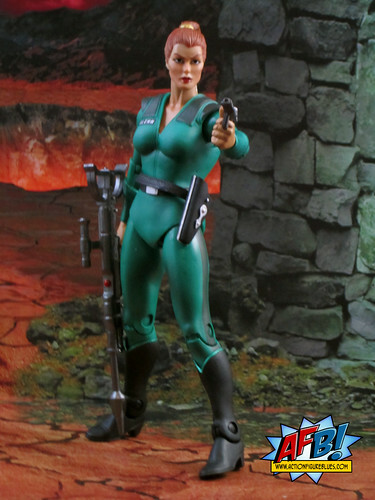 In addition to the Queen Marlena head and bodysuit, there is a staff and a sword for the Queen, while Captain Glenn has a ray gun, rifle and removeable space helmet. I prefer the look of Captain Glenn when she isn’t wearing her headgear, but the helmet does look fantastic. As for Queen Marlena - she looks pretty amazing wielding that sword! Mattel recently said in an answer to one of our “Ask Matty” that there is a hypothetical plan for MOTUC that runs over ten or so years. They certainly know how to mine the licence for all of its hidden gems, and this exclusive is a great example of that. I wonder what they have up their sleeves for next year’s SDCC? This is a figure I'd like to get someday. Except for Cringer, I always hated him. I would of loved to have gotten a hold of one of these just a awesome figure. It's a great set. I love the retro-space feel. It's figures like this that test my resolve not to buy into another action figure line. This, and things like Battle-Armour Faker and the forthcoming Fearless Photog release put me right there smack in the middle of gottahaveit territory for sure.